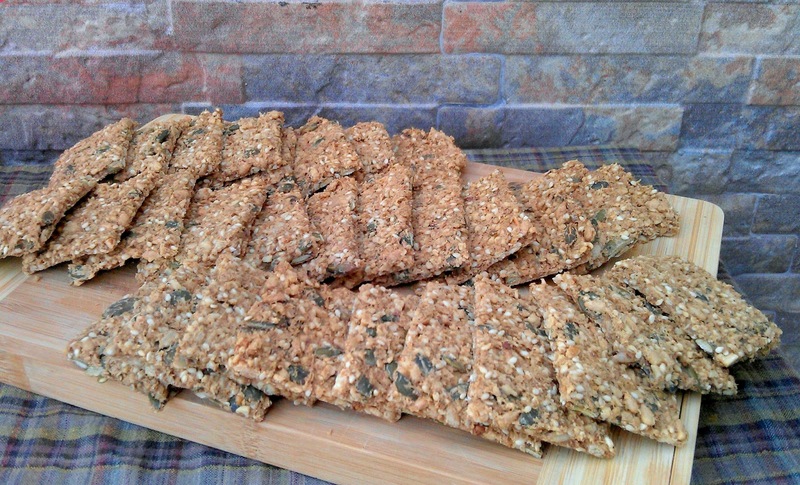 I was craving for crackers and found a brilliant recipe at Andrew's blog . The good thing: it is incredibly heavenly crunchy. The other good thing: it tastes great and oh! No crazy ingredients, it's all natural. I substituted some of the ingredients e.g. bran & almond flour with oatmeal flour (oatmeal grinded with food processor) And I added some anis seeds for fun. 1. Mix the ingredients incl. water and let it sit for 15 minutes. Preheat the oven on 150/160 Degrees Celsius. 3. Put it in the preheated oven for 15 minutes. 5. Take the baking sheet out of the oven, put an oven rack on top of the crackers and turn everything upside down. Remove the parchment paper and place the rack in the oven for 15 minutes with the heat turned off. Let it cool in the oven with the door slightly open. Knäckebröd or knekkebrød…? When it says: "C-R-A-C-K! ", you know it's the right one!